In an effort to answer common questions related to strength and conditioning for runners, and perhaps to debunk myths about the topic, Kristina Pattison recently caught up with experts in the field for perspective. 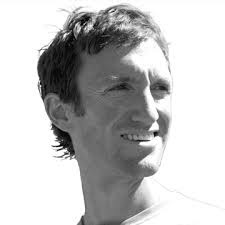 In this interview, elite ultra distance mountain runner Mike Wolfe sheds light on the topic through the lens of over a decade of experience running the toughest events and projects on the planet. Mike’s passion and enthusiasm for running long distances in the mountains stem directly from his upbringing. Growing up in the mountains of Montana, his family vacations were weeklong backpacking or hunting trips instead of trips to Disneyland or Cancun. A love of long treks and adventures in the mountains was instilled in Mike from an early age. Mike began competing seriously in mountain ultra-running in 2006 when he ran his second 50-mile race ever, at the US Track and Field Association 50-mile trail national championship. Mike won the race outright that year, then returned to win again in 2007. 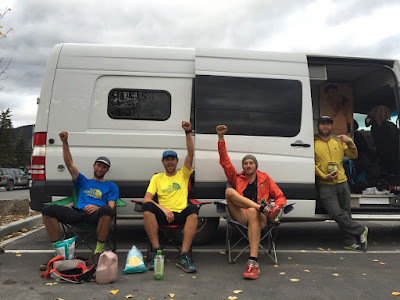 Later that summer, Mike won his first 100-miler, the Grand Targhee 100 in Wyoming. Mike has since been racing competitively as a professional mountain ultra-runner for over a decade. As a Global Athlete for The North Face, Mike has competed in over 75 ultra-distance mountain races around the world. Among the many races he has competed in, he holds numerous course records, and has won or place top-3 at the world’s most competitive and prestigious mountain races: the Western States 100, the Ultra-Trail du Mont Blanc, and the North Face 50-mile Championship, among others. 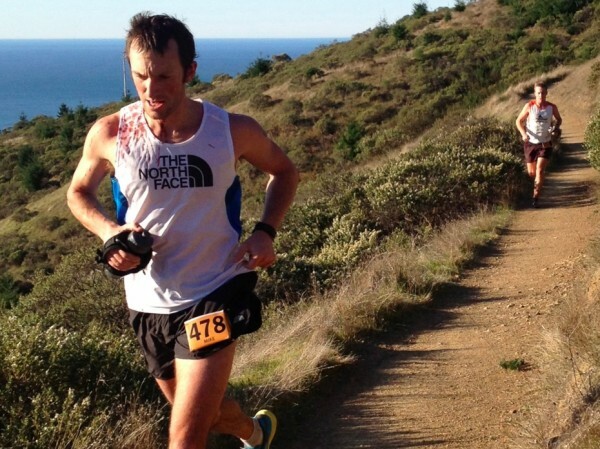 Mike running to the win at The North Face Endurance Challenge 50-Mile Championship. Photo: Bryon Powell from Dakota Jones' post race commentary. As an elite trail and mountain runner who has seen the podium of some of the most competitive ultras globally, including Western States 100 and Ultra Trail du Mont Blanc, what benefits do you believe runners gain from participating in a regular conditioning program? Durability and injury prevention. When I’ve been at my best as a runner over the years it’s when I running a ton, and not really doing anything else. However, it’s always a fine line to ride; how long can you hang on to that edge before you get injured. I wish I would have known to do basic strength maintenance years ago, as I would have staved off a few injuries. I believe maintaining some strength conditioning as part of your training is critical to maintain balance in your body, and by doing the right strength exercises, it can also help make you a better runner. You recently came back from a severe ankle injury and surgery. Has your perspective changed on strength and conditioning for running? And if so, in what ways? Before my ankle debacle I did strength and conditioning in the off season and pre-season only. Once the running/racing season came around, I would try to cut out all strength work, to focus all my energy on running. Hence injury occurred. Now I believe there is a place for year-round strength and conditioning in my training, even during the peak periods of my training, and racing. However, the exercises and timing of doing them has to be very carefully planned and controlled during those peak periods, and I believe (for the ultra-runner) only basic maintenance with strength needs to be performed during the peak of your season. How does developing strength and power differ from performing conditioning and what place do each have in a runners routine? Strength and power are about using weight training to develop muscle strength. Conditioning is using high intensity efforts—which may be in the gym, with our without weights, or outside doing your actual sport—to develop your cardiovascular system, your aerobic work capacity. Both are valuable for different reasons. It’s obviously beneficial for runners to be stronger, as long as that strength is specific to running. 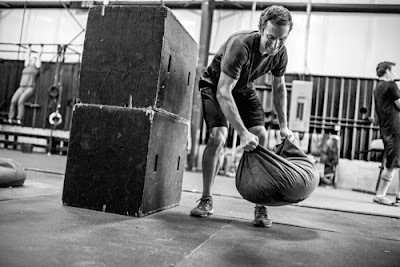 Strength training is also great for injury prevention and durability. You develop strength in the muscle groups that become weak from running. Conditioning to develop your high end aerobic capacity is also beneficial because as long distance runners, the goal is to maintain a certain level of output for a really long time, with minimal effort (this is endurance). The better conditioned you are as a runner, the less energy you have to expend during a 50 or 100 mile effort. If I had to put a value on strength and conditioning for runners, I’d say conditioning is more important that strength, but strength should not be left out of the equation. Can you describe functional training and how that differs from just weight lifting? Functional training is sport specific. So, as an example, runners don’t need to be in the gym working on increasing their one-rep-max bench press, right? That’s ridiculous. Runners should be in the gym doing exercises that directly translate to increased running performance and durability: deadlifts, squats, core stability work, high-intensity plyometric exercises, etc. 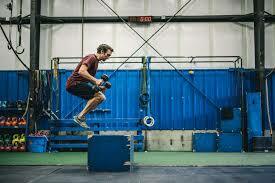 Mike Wolfe training plyometric power. Photo: Mountain Athletics. What kinds of exercises are the most valuable for a trail runner? And does this differ based on length or terrain of the race? I think the biggest benefit trail runners gain by hitting the gym is to work on the durability of your body. Trail running is demanding in that it engages more diverse muscle groups than pounding pavement. In a long trail race you're climbing steep trails, using more of your quads and glutes, descending trails where your leg muscles get pounded with intense eccentric movements, you’re engaging your core and low back when navigating uneven terrain, often your carrying water bottles in your hands, or even trekking poles in some longer races. Sometimes after races I feel like I got a total body workout. So, I think the most valuable exercises are those that make your body durable for the beating it will take. Obviously, most of your training for this should be actually out trail running! But, in the gym you can isolate muscle groups to work on, and target different parts of the body to essentially get more bang for your buck, to get tough quickly. Lots of core exercises (abs, back, obliques, and this also includes lots of work on the hips and glutes, which are critical for trail runners to keep strong), and then functional strength and conditioning exercises for the lower body: lots of “hinge” work (deadlifts, squats), balance work to strength stabilizer muscles in the hips, calves and ankles, and I am a big proponent of single leg exercises. I think we all have deeply ingrained weaknesses somewhere in our bodies, those are accentuated from repetitive motion sports like running, and the weaknesses are usually on one side of our body or another. This creates alignment issues, and causes injuries due to unconscious compensation. So, doing single leg (or arm) exercises, where we target only one side of the body at a time, exposes the weaknesses and allows us to target the problem and work to fix it. 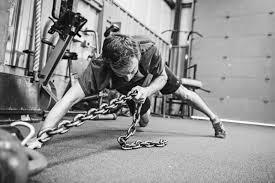 As examples, one-leg deadlifts, split-squats (or bulgarian squats), one-leg box hops, turkish getups, one-leg jump roping…all these types of exercises work on weak links in the chain. Mike Foote and Mike Wolfe on Great Northern Peak during the Crown Traverse. You are known for extremely arduous long distance running over mountainous terrain. Most recently, you completed the 600-mile Crown Traverse, and in 2014 you set a fastest-known-time on the 223-mile John Muir Trail. What parts of the body tend to break down the fastest over the long haul? And are there any kinds of exercises that will benefit a trail runner participating specifically in ultra long distance events or projects? What I have experienced from these uber long efforts is that all the little minute weaknesses and imbalances (that you might be able to stave off during a single event or effort, like a shorter 50-100 mile race) rear their ugly heads over time when you are super fatigued, over a period of days or weeks. The little niggles that you don’t address during training because they don't seem to materialize into anything debilitating are the things that sneak up and get you during an epic slog like the JMT or Crown Traverse. Also, I will say that surviving—and completing—long efforts like those depends a lot on your level of experience and years and years and years of conditioning your body (and your mind!!) for that kind of effort. Mike Wolfe, Mike Foote, Steven Gnam and David Steele on the Crown Traverse. As the main racing season for runners is the summer, when should runners focus on a conditioning program and should it change during racing season? Conditioning for runners should be implemented regularly in training in the winter-spring. As soon as deliberate training for summer race season begins, conditioning should be part of the program. During race season, it’s much more an art of fine tuning, and knowing how much you even need to do, because often it’s less than you think. There is not much conditioning you should be doing during actual race season. Assuming a runner is doing two quality speed days during the week, and at least one long run on the weekend, when is the best time to perform conditioning exercises during the week? Sometimes—athlete dependent—I think it’s ok to stack a conditioning workout on the same day as a speed workout. But, this is for a more highly trained athlete. Otherwise, I would recommend staggering workouts, to allow rest days in between: e.g., Monday = rest, Tuesday = speed, Wednesday = recovery run, Thursday = run + conditioning, Friday = recovery run, Saturday = long run, Sunday = run + lighter conditioning session. 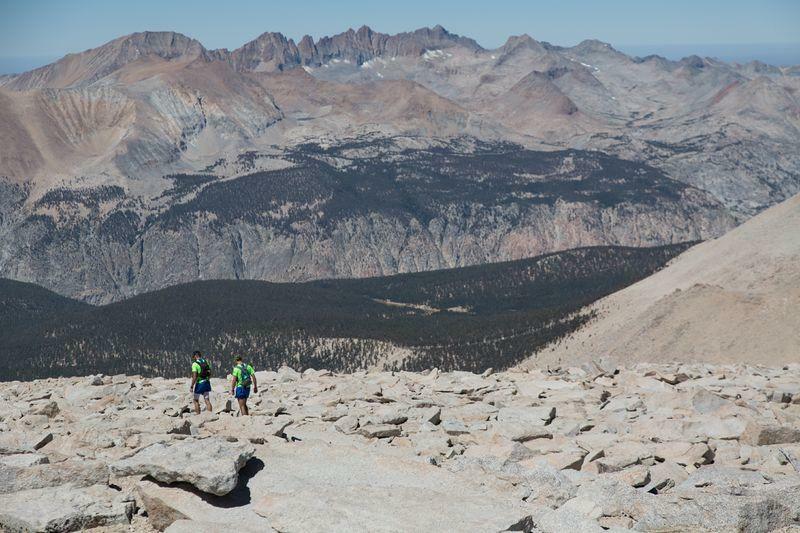 Mike Wolfe and Hal Koerner on the John Muir Trail. Photo: Tom Robertson for The North Face. How much time should an athlete dedicate to running specific conditioning? In the pre-season and off-season, 1-2 days a week. 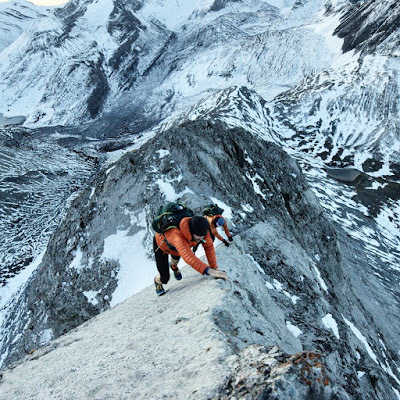 What role have you played with the development of the North Face Mountain Athletics program? What is the purpose of the program, and how can athletes utilize the information to develop their fitness for running? I helped develop the training for mountain runners, and participated in development of instructional video series people can use. There is a Mountain Athletics App that people can use to download actual training programs for different distance trail races. What key principles can you share that you have learned through the process of becoming not only an elite ultra distance mountain runner, but from your background in rock climbing and working with the North Face Mountain Athletics program? Don’t take all this training/racing too seriously! Don’t take yourself too seriously! Do it because you love the sport, because you love being in the mountains. If the fun is gone, then why do it? Also, even though I am a big fan of strength training and conditioning, I truly believe that first and foremost there is no substitute for being out there actually doing the sport you love. The best runners or climbers in the world are the best because they started at a young age, and they simply ran and climbed a TON, not because they were in the gym training. Get outside! And, get outside and do the sport you love with the community of friends and family that support you, and share in the same values you do of being in the mountains. 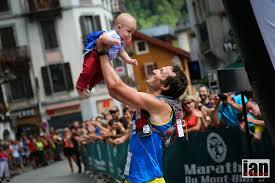 Mike with son Colt after finishing top American at the 2014 Skyrunning World Championships. Kristina Pattison is an ultra-distance mountain and trail runner from Missoula, Montana. She works as a doctor of physical therapy and is a Certified Strength & Conditioning Specialist who found inspiration in the adventures of Mike Wolfe long before she considered herself a runner.